A ball valve is mainly used in the pipeline to distribute the flow and change the flow direction of the medium. It can be closed tightly by only a small torque and being rotated 90 degrees. The ball valve is most suitable for use as a switch or shut-off valve. Ball valves were introduced in the 1950s. With the rapid development of science and technology, the continuous improvement of production technology and product structure, ball valve has rapidly developed into a major valve category in just 50 years. Since ball valves typically use rubber, nylon, and Teflon as the seat seal material, their service temperature is limited by the material of the seat seal. The cut-off function of the ball valve is achieved by the metal ball being pressed against the plastic valve seat under the action of the medium (floating ball valve). The valve seat seal is deformed by elastic deformation in a local area under certain contact pressure. This deformation can compensate for the manufacturing precision and surface roughness of the sphere and ensure the sealing performance of the ball valve. Also because the seat seal of the ball valve is usually made of plastic, in the structure and performance of the ball valve, the fire resistance and fireproof of the ball valve should be considered, especially in the petroleum, chemical, metallurgical and other industries. One should pay more attention to fire protection when using ball valves in equipment and piping systems with a flammable and explosive medium. Ball valves can be divided into floating ball valve, trunnion ball valve, track ball valve, V-shaped ball valve, three-way ball valve, stainless steel ball valve, cast steel ball valve, forged steel ball valve, dust discharging ball valve, anti-sulfur ball valve, welded ball valve. In addition, according to the function and transmission form, it can be classified to air ball valve, bypass ball valve, pressure-release ball valve, drainage ball valve, or pneumatic ball valve, electric ball valve, hydraulic ball valve, pneumatic hydraulic ball valve, electric hydraulic ball valve, turbo driving ball valve. The ball of the ball valve is floating. Under the action of the medium pressure, the ball can generate a certain displacement and press against the sealing surface at the outlet end to ensure the sealing of the outlet end. The floating ball valve has a simple structure and good sealing performance, but the load of the ball subjected to the working medium is all transmitted to the outlet sealing ring, so it is necessary to consider whether the sealing ring material can withstand the working load of the spherical medium, and when being subjected to a high-pressure impact, the sphere may be offset. This structure is generally used for medium and low-pressure ball valves. The ball of this ball valve is fixed and does not move after being pressed. The Trunnion mounted ball valve has a floating valve seat. Under medium pressure, the valve seat moves, so that the sealing ring is pressed against the ball to ensure the seal. It is usually mounted on the upper and lower shafts of the ball, the operating torque is small, suitable for high pressure and large diameter valves. The seat material is generally non-metallic, such as PTFE, RPTFE, nylon, PEEK, PPL, etc. The sealing surfaces of the ball and the valve seat are usually subjected to hardening treatment methods such as carburizing, nitriding, spraying, surfacing and the like. The structural feature of such a ball valve is that the valve body is made in one piece. A valve cover, a ball body, and a valve seat are mounted on the upper portion of the valve body. The advantage of the top-mounted ball valve is that it is not necessary to remove the ball valve from the pipeline when servicing and replacing the valve seat. Only open the valve cover and lift the ball. Three-way ball valves are available in T and L versions. The T-type enables three orthogonal pipes to contact with each other and cut off the third channel to function as a split and merge. The L-type three-way ball valve type can only connect two pipes that are orthogonal to each other, and cannot keep the third pipe connected to each other at the same time, only to distribute. It has the lowest flow resistance (actually zero). The ball valve will not get stuck when there is no lubricant, so it can be reliably applied to corrosive media and liquids with a low boiling point. A 100% sealing performance can be achieved over a wide range of pressures and temperatures. It can realize ultra-fast opening and closing. The opening and closing time of some structures is only 0.05-0.1s, which can be used in the automation system of the test bench. When the valve is quickly opened and closed, the operation is shock-free. The ball-type closing member can be automatically positioned. The working medium is sealed reliably on both sides. 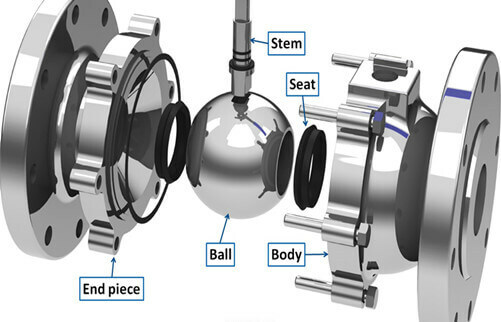 When fully open or fully closed, the sealing surface of the ball and the seat is isolated from the medium, so the medium that passes through the valve at high speed does not cause erosion of the sealing surface. Ball valves are compact and lightweight, can be considered as the most reasonable valve structure for low temperature media systems. The valve body is symmetrical, when welded to the valve body structure, it can withstand the stress from the pipe well. The closing member can withstand the high pressure difference at the time of closing. Ball valves with all-welded valve body can be buried directly in the ground, so that the valve internals are not eroded. The maximum service life can reach 30 years, it is the most ideal valve for oil and natural gas pipelines. The unique characteristics of the ball valve determine the use of it is relatively wide, usually in the two-position adjustment. With their good sealing performance, quick opening and closing action (1/4 turn open and close), ball valves are recommended for piping systems with high pressure cutoff (large differential pressure), low noise, low operating torque and low fluid resistance. Ball valves are also suitable for use in piping systems that have lightweight structures, low pressure cut-off (small differential pressure), corrosive media. Ball valves are also available in low temperature units and piping systems. In the oxygen piping system of the metallurgical industry, ball valves that have been strictly degreased are used. When the main line in the oil pipeline and the gas pipeline is to be buried underground, a full-bore welded ball valve is required. When a regulating performance is required, a ball valve with a V-shaped special opening structure is required. In petroleum, petrochemical, chemical, electric power, urban construction, metal-to-metal sealed ball valves are available for piping systems with operating temperatures above 200 degrees. Ball valves with the full bore and all welded structure are used for the main line for the transportation of oil and natural gas, and the pipeline that needs to be cleaned, and buried underground. For pipeline buried on the ground, choose ball valves that are all welded or flanged. For branch pipes, choose ball valves with flange connections, welded connections, full bore or reduced diameter. For refined oil pipeline and storage equipment, use ball valves with flange connection. For city gas and natural gas pipeline, choose floating ball valves with flange connection and internal thread connection. In the oxygen pipeline system in the metallurgical system, a fixed ball valve that has undergone strict degreasing treatment and has flange connection should be used. For the piping system and equipment of the low temperature medium, a low temperature ball valve with a bonnet should be used. On the piping system of the catalytic cracking unit of the refinery, a lifting rod type ball valve can be selected. For chemical system devices and piping systems with acid and alkali corrosive medium, it is advisable to use all-stainless steel ball valves made of austenitic stainless steel and Teflon as the seat seal. Metal-to-metal sealed ball valves can be used on piping systems or devices for high temperature media in metallurgical systems, power systems, petrochemical plants, and urban heating systems. For flow adjustment, a worm-gear, pneumatic or electric ball valve with a V-shaped opening is available. The use of ball valves is very extensive, whose variety and quantity continue to expand. And as the developing of ball valves with high pressure, high temperature, large mouth, high sealing performance, long service life, excellent regulation performance and multi-valve function, the reliability and other performance indicators of this kind of valves have reached a high level and ball valves can be used for partially replacing gate valves, globe valves, and regulating valves. With the technological advancement of ball valves, there will be a wider range of applications in the foreseeable short-term, especially in oil and gas pipelines, on refinery crackers and in the nuclear industry. In addition, in the large-and-medium-sized, medium-and-low-pressure areas of other industries, ball valves will also become one of the leading valve types. A ball valve is mainly used in the pipeline to distribute the flow and change the flow direction of the medium. It can be closed tightly by only a small torque and being rotated 90 degrees.